With some complex structures, due to size or shape, it is more difficult to determine which instruments are needed or where they should be installed for efficacy. However, expert structural analysis is available. 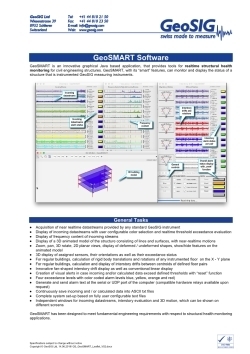 GeoSIG — through a strategic alliance with Dr. Farzad Naeim, an internationally renowned expert in structural health monitoring — can offer consultancy and turnkey solutions for structural health monitoring of all types of structures including high-rise buildings, public buildings, bridges, tunnels and other special structures. 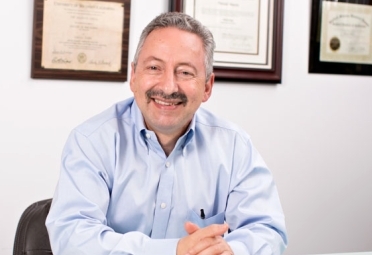 Using the expertise of the highly respected Dr. Farzad Naeim, who boasts over 35 years' experience and publications ranging from textbooks to journal papers, you can have peace of mind that your structure is safely surveyed and the most reliable solution is specified. GeoSIG, with more than 25 years' expertise in structural monitoring solutions, can fulfil the requirements of the most challenging structure. 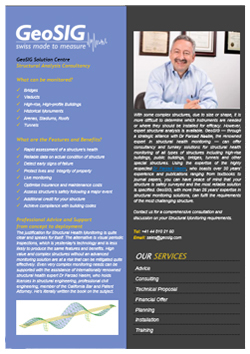 Click here to visit his Website, or look over the solutions leaflet to see what we can offer. Consider a typical office building with up to 500 people working in it. After a substantial natural or manmade disaster; the building’s owners would typically need to have a structural safety survey done before allowing the office workers back in to the building. The process can take from many hours to a number of days depending on the size of the building and the suspected damage. However, had the proprietor installed a live monitoring system; he would have been able to instantly say whether the safety levels had been breached. What is the cost of the survey? What is the cost of lost time due to 500 office workers being idle? Located on the corner of Hollywood and Vine on the world famous Walk of Fame in Hollywood, California, the W Hotel and Residence project was planned to be the linchpin of the Hollywood renaissance. The mixed-use project comprises an 11-story hotel with 305 rooms, a 15-story residential tower with 143 condominium units, and three levels of subterranean parking. In the same complex are also four residential towers, 8-12 stories each, with 374 total apartments, as well as parking on five levels above grade and two levels below grade. The Hollywood fault is an active fault (approximately 14 km in length) located along the Los Angeles basin’s northern edge; it is part of a system of seismically active folds/faults that make up the transition zone between the Transverse and Peninsular Ranges. It has never produced a significant earthquake in recorded history, but if the fault eventually ruptures by itself its size and geology could produce a sizeable quake approximately every 1,600 years, according to USGS. If the Hollywood fault is actually a continuation of the somewhat larger nearby Raymond Fault, they say, the combined strength of a rupture along both faults could produce a high-magnitude quake, though such an event would likely happen only once every 3,000 to 5,000 years. However remote, there is always this possibility. Such a large complex of many stories — which houses so many people — requires high-rise building monitoring both for the safety of the people and for the structural health of the complex itself. Our Partner — Seismic Systems in Simi Valley, California, USA — specializes in purchasing, installation, and service of earthquake and monitoring equipment. 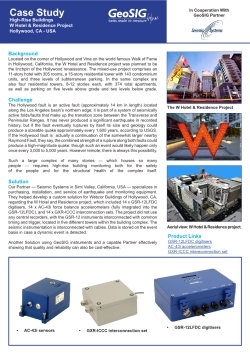 They helped develop a custom solution for Webcor Buildings of Hollywood, CA, regarding the W Hotel and Residence project, which included 14 x GSR-12LFDC digitisers, 14 x AC-43i force balance accelerometers (fully integrated into the GSR-12LFDC), and 14 x GXR-ICCC interconnection sets. The project did not use any central recorders, with the GSR-12 instruments interconnected with common timing and trigger, located in five different towers within the building complex. The seismic instrumentation is interconnected with cables. Data is stored on the event basis in case a dynamic event is detected. Another Solution using GeoSIG instruments and a capable Partner effectively showing that quality and reliability can also be cost-effective.